Dubai is the Middle East’s powerhouse of enterprise; its skyscrapers tower over dozens of square miles of business and nearly ten million residents swarm between developments that continue to sprout overnight like bamboo. The desert, mystical and otherworldly, begins at the fringes of the city and spreads inland, between isolated towns and sweeping highways that allow drivers to speed through the inhospitable dunes. 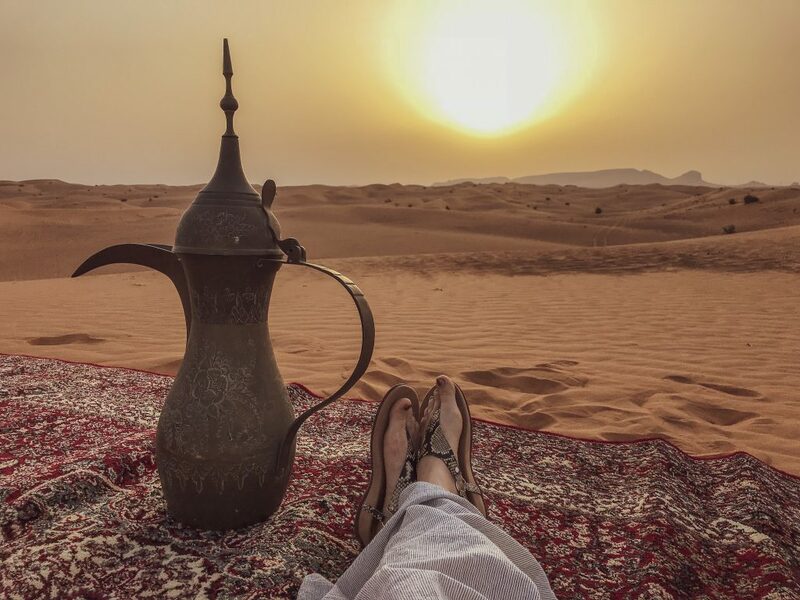 The desert is, however, part of the visitors’ must-see list in the Emirates and the best way to see the desert is with a tour company, such as Orient Tours LLC Dubai. 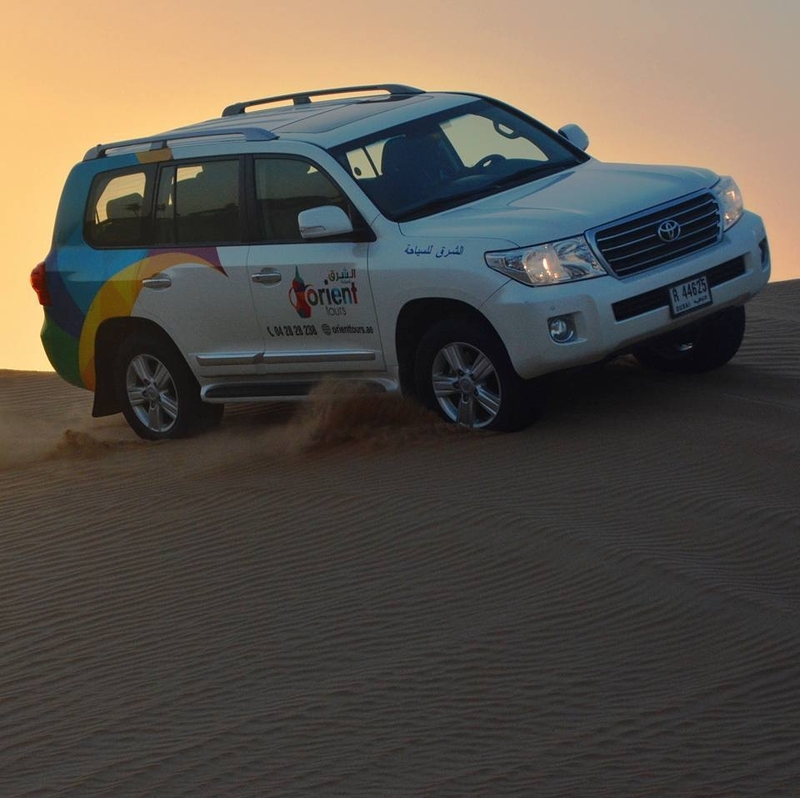 Orient Tours LLC have branches across several of the Emirates, providing a range of experiences in Dubai, Abu Dhabi and the surrounding areas. Tours include guided city adventures and dining cruises about traditional dhows, as well as quad bike riding, helitours and multi-city tours. 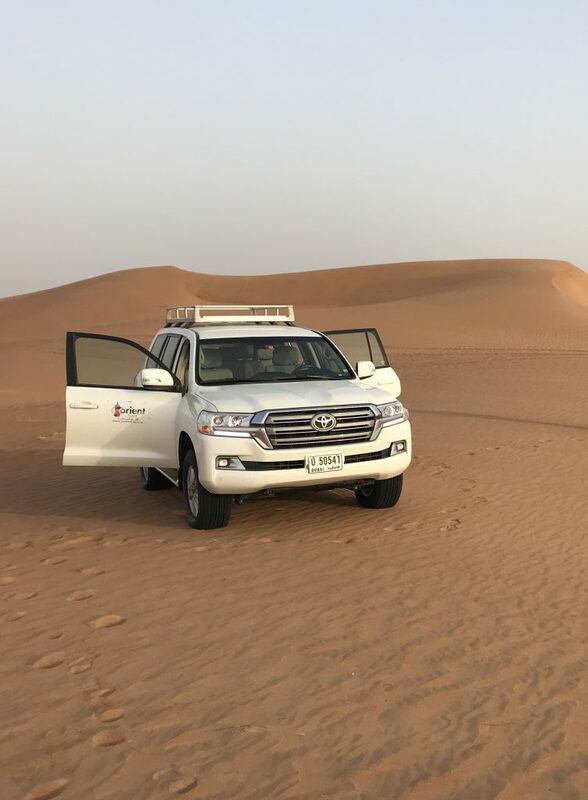 We had chosen The Sunriser Tour, a jeep safari into the red sand dunes of Al Khatam, with a light picnic breakfast and falconry display which has been available through Orient Tours for two years. 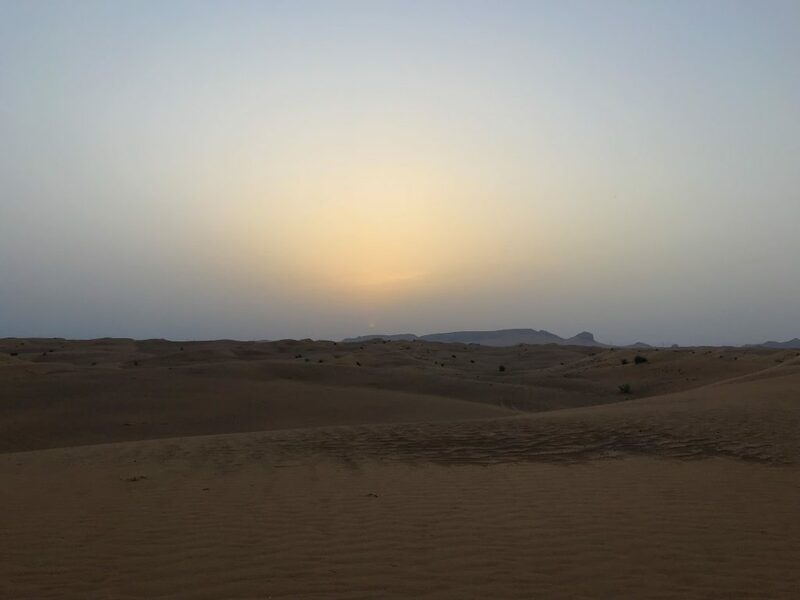 It was a very early start; tumbling out of bed at 4.30am after a typical Dubai evening on the tiles was no easy feat, but a quick coffee put us in the right mood for the initial hour-long drive into the desert, to the place where we would meet the rising sun. A few extra layers of clothing were sufficient, since the temperature plummets at night, but the Orient Tours jeep was very comfortable and we enjoyed the drive, watching as we travelled the built up city melt away as the dawn light began its slow assault on the darkness of night. 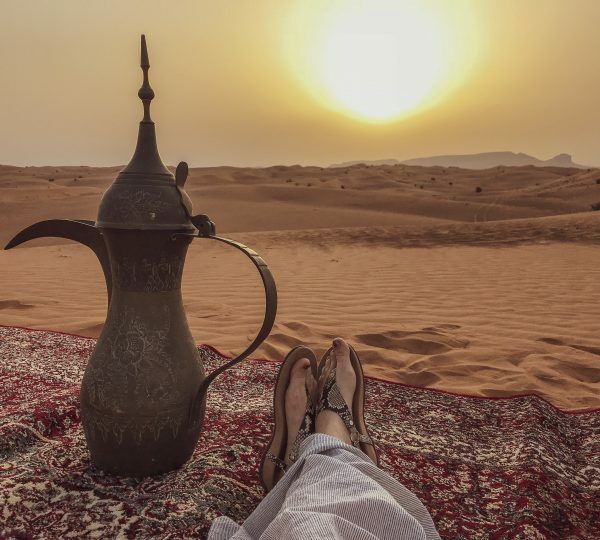 The cocoon of Dubai is deceptively comfortable, with ubiquitous air-conditioning and extensive luxury facilities, so it is hard to imagine that the Bedouins of a mere century ago were carving out their existence in this harsh terrain. Only a few miles out of the city, the dunes stretch as far as one can see in every direction, only the occasional scrubby tree and the even less common camel cutting a sharp silhouette against the sky. Our driver Yarif, one of Dubai’s many Indian immigrants, originally hails from Chennai and was happy to answer all our searching questions about the life of an immigrant in a city where millions of people from across the globe have sought new lives. He was also able to provide lots of information about the significance of passing locations in Emirati culture: the camel racing track, the new mosque being built and the main home of Dubai’s Sheikh. As we found ourselves on empty roads, with the sun making a speedy approach, we swerved off the tarmac and stopped to deflate the tyres of the jeep – rule number one of driving on sand. The sand was cool on our feet as we stepped out to take some photos and admire the silence of our surroundings; nothing could be more different than the constant hum of traffic and people in Dubai. Another five minutes of driving took us into an isolated valley between the dunes, where Yasif quickly set up an ornate rug and tea urn in preparation for our breakfast, while we gazed at the spread of sunrise behind the haze of morning. Between the dunes there is a magical kind of peace, not least because this is the kind of terrain in which the unexperienced should not travel alone. 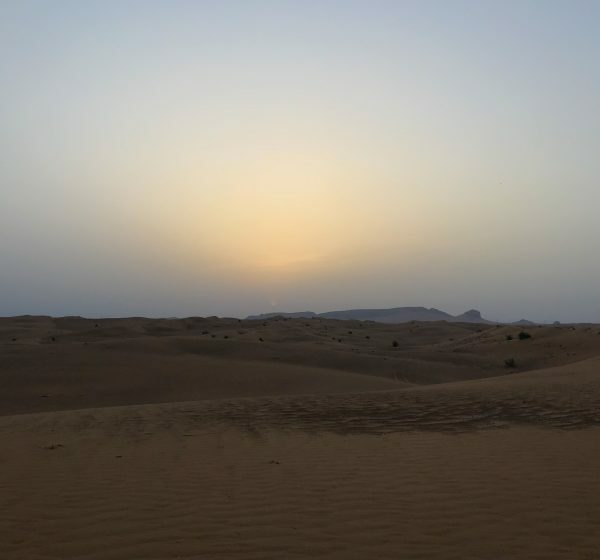 Even with a guide, there is a sense that the desert permits rather than encourages intrusion; tourists are aliens in this sort of land, softly fleshed and unprepared for the heat and hardness of the endless sand. At 6am, the temperature is already rising and the desert wind puffs dryly in warning, but the sun continues inexorably into the sky, flaming orange edging slowly across the horizon. It’s a unique and moving experience, the sort of moment that – as I am sure is apparent – demands that a writer dig deep for words to do it justice and still fails to capture its beauty. We ate a nice little collection of sandwiches and nibbles, then were met by Aliyah, the gyrfalcon, and her handler. 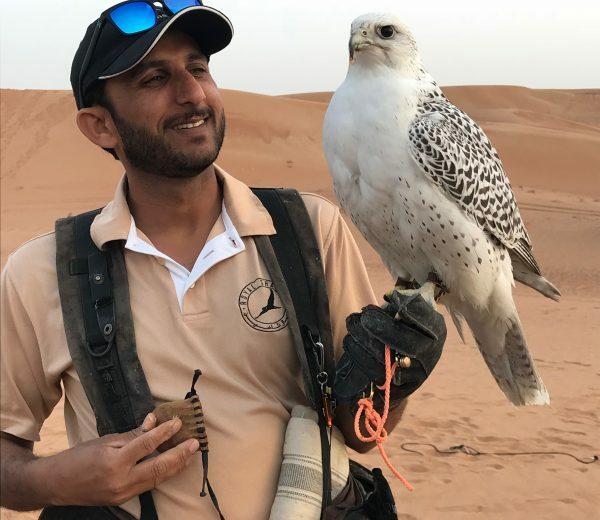 It was interesting to find out about this hobby of the Emirati elite (only national airlines will permit a falcon to be transported aboard with its owner and it must have its own first class seat) and fascinating to see Aliyah fly in a demonstration of training exercises. 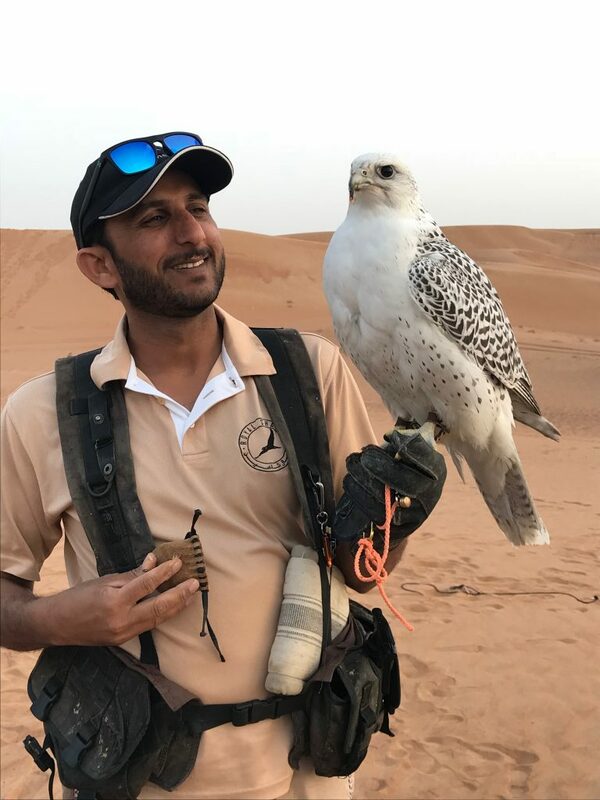 The relationship between falcon and handler is not one of affection, at least not from the falcon, who will only return to the owner if he has food and the bird is hungry. Getting the chance to hold such an impressive bird of prey was a highlight of the trip, even though her disdain for me was quite clear when she spat part of the dead chick she was eating into my face! After breakfast, Yasif showed off some incredible driving skills, drifting and leaping across the dune banks at breakneck speed, as we bounced around the inside of the jeep like popcorn. A few more photo opportunities later and we began the long drive back to Dubai, stopping at the nearest petrol station to reinflate the tyres on the way. The whole morning was a once in a lifetime adventure, producing memories that my photos have been unable to capture and a feeling of awe that my words are insufficient to express. As well as a number of other experiences, Orient Tours LLC also provided us with transfers to and from the airport. Through all our interactions with drivers and customer services, staff were a pleasure to talk to and made the whole process of organisation simple and super efficient. 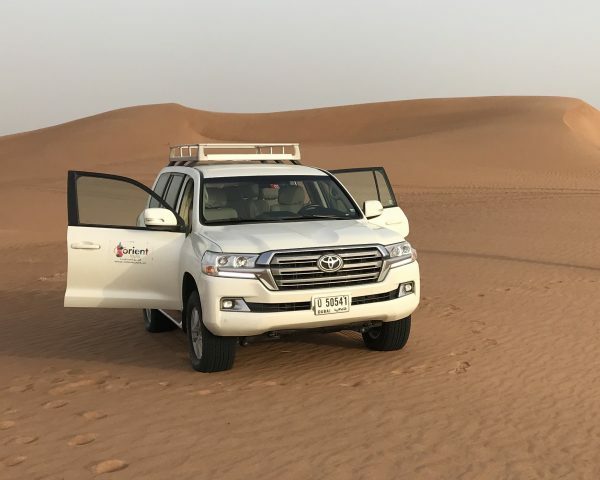 If my travels ever take me to the Emirates again, I would not hesitate to ask Orient Tours to be my guide along the most interesting paths.